Originally uploaded by Ahmed Rabea. One office. One coffee pot. Multiple coffee makers. Each subscribing to a different scoop maximum. The setting: early morning. Bedraggled employees file into work. Thinking of one thing: COFFEE! But will it be made? Or will they have to make it? And if it is made, who made it? Dilemma! Because if person A made it, one spoonful of creamer will be a wave of whiteness practically turning my coffee into chocolate milk. But if person B made it, I will need to start running the hot water now and get out another spoonful of creamer to fortify it. If person C makes it. 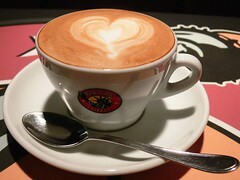 Sweet, lovely, firm gripped Person C. My calm aromatic anchor in the coffee river. Then it could be coffee nirvana. The sky will be bright with rainbows and dogs and cats will live together in harmony. I love Person C, so, so, much. Posted by Heidi Schempp Fournier at 9:52 a.m. I'm totally person C in our office so thabkyou for your kind words!! !